The Robinson / Fujisawa house combines Midwest informality with a ceremonial influence blended in plan and detail. It has a tranquil and meditative presence on its generous site. Designed as a summer lake house cottage for Glen Lake, Michigan, it features a Great Lakes cottage vernacular style of natural cedar siding and white stained exterior trim, and cherry interior trim. Great windows and outdoor living areas connect this home directly to nature. Galvalume corrugated metal for soffits and interior ceilings complements the "silver gray" cedar siding and provides a soft reflective glow. The plan is designed to a 9-square grid to simplify construction and to standardize the size of its principal framing members. 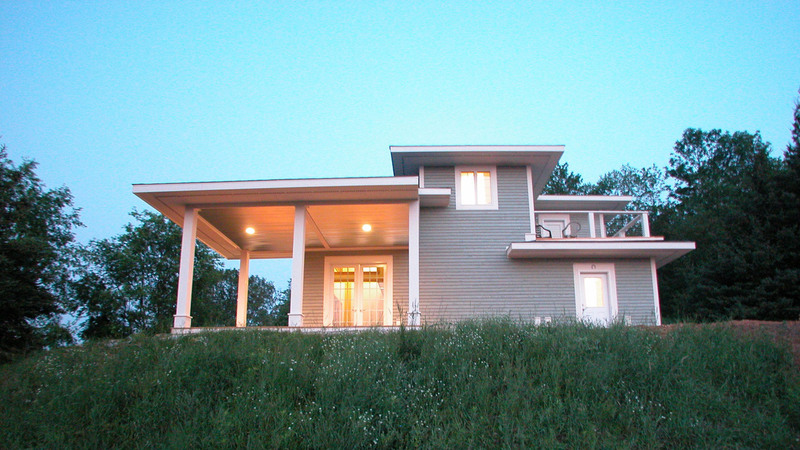 Its roof glides down to oversailing eaves that embrace wraparound outdoor porches and decks. It takes full advantage of stunning views and natural light, with large windows and glass doors that bring the outdoors inside. Though designed primarily for summer use, it is suitable for year-round living.